New, improved ON&ON Diabalife capsules contain 100% stabilized Allicin. This novel formulation contains well-known Ayurvedicactives like Gudmar, Arecanut, and Neem, indicated in Ayurveda to work in metabolic syndrome. Published scientific studies have corroborated these benefits in human subjects. Regular consumption of the herbs present in this product is known to help by managing the body's natural sugar management process and help build immunity from common ailments. For best results, recommended regular consumption for 60 days. Consume New ON&ON Diabalife along with your regular medication ensuring that you are keeping a minimum gap of 1 hour between your regular medication and Diabalife. How is New Diabalife different from the current product? Have we removed any ingredients from the current product? Is the allicin the same as what was used earlier? New Diabalife is different in composition from the current Diabalifeas more new ingredients have been added to improve the functioning benefit of the product. None of the earlier ingredients in the composition have been removed and all of them continue to be present in the new Diabalife. More over, the new Diabalife contains the same stabilized allicin at the same level as was present in the earlier product. It may be noted that scientifically proven and known ayurvedic ingredients that promote efficacy in diabetic persons namely gudmar, neem and arecanut have been added to enhance the efficacy of the product. The content of the product (capsule) has gone up to 510mg from 210mg earlier. What are the ingredients of this product ? 100% Stabilised allicin, Elephantous scaber, karela, Spinaciaoleracea, Cinnamomum zeylanicum (dal chini) along with additional new ingredients added namely gudmar, neem and arecanut. How is this product different from other products for sugar management available in the market? 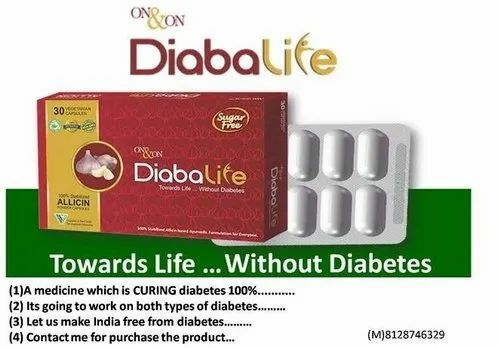 Should this product be given for normal customers, pre-diabetic customers or diabetic customers? Will the dosage be different in each case? New Diabalife capsules are meant for both prediabetic and diabetic customers. It is required to be taken by diabetic customers in addition to their regular medication with a gap of 1 hour between them. As with all products consumed by diabetics periodical determination of blood sugar levels and HbA1C is recommended and review with their physicians. New Diabalife is not intended for normal customers. 100% stabilized AllicinCinammonKarelaElephantous scaberNeemArecanutGudmar & Cheera along with suitable excipients in a 100% vegetarian capsule. CHERRY : Contains low calories yet rich in nutrients, vitamins and minerals. Cherry contains Anthocyanins which reduce chronic painful gout arthritis, fibromyalgia (painful muscle condition) and sports injuries. Cherries are rich in Melatonin - a powerful anti oxidant that can cross the blood-brain barrier easily and produce soothing effects on the brain neurons, calming down nervous system irritability which helps relieve neurosis, insomnia and headache conditions. CRANBERRY : An excellent source of Vitamin C. Its infection fighting properties helps in Asthma & Urinary Tract Infection. It reduces Ulcer and prevents peptic Ulcers. RED CURRANT : Low in fat and calories, Rich in Fiber, Vitamin C, Potassium, & Magnesium, Red Currants help digestion, regulate bowel movements, and treats constipation. It helps regulate blood pressure and improves muscle cramps, weakness and irregular heart beat. ELDERBERRY : Packed with strong anti-viral properties, Elder berries helps fight flu & cold, reduces phlegm, strengthens upper respiratory system & reduces inflammation. Elder Berries are useful in curing Mouth Ulcers, Tonsilitis and Sore Throats. GOJI BERRY : Also known as Wolf Berry, the medicinal benefits of Goji Berry is unlimited. It is especially used in the treatment of Diabetes and improves the eye sight and the functioning of the brain. Goji Berries are an excellent source of immune system booster and helps relieve sleep dis-orders. ACAI BERRY : Avery strong source of anthocyanins, Acai berry strengthens the functioning of the heart. It is also a rich source of protein and dietary fiber and Omega 6 & Omega 9 fatty acids that help in lowering the cholesterol in the blood. ON & ON 9e5 Premium health drink contains Pro-Anthocyanins & several other Biologically active substances that improves our body's immune system and offer protection against various life style related dis-orders. Good health is natural & Good health is available to everyone. Every second when you breathe-in, millions of germs, viruses & bacteria enter into your body. Who destroys these? Modern day chemicals or your body'sown IMMUNESYSTEM? Did our fore-fathers use synthetic chemicals to live healthier & longer? Why do you want to suffer? ON & ON 9e5 Premium health drink is the natural alternative solution to chronic health problems. ON & ON 9e5 Premium Health Drink is an active formulations of natural key ingredients like Amla, Noni, Aloe Vera, and a unique combination of 13 different berries - Wild Berry, Strawberry, Blackberry, Raspberry, Blackcurrant, Blue Berry, Cherry, Cranberry, Red Currant, Elderberry, Goji berry, Cranberry, Acai Berry - Collectively possess all key Vitamins, Minerals, Enzymes, Metals, Amino Acids, etc, that are required to compensate for the shortage caused by modern living conditions and bring the body to its natural level. ON & ON 9e5 Premium health drink strengthens your immune system. Then, your Immune system fights various diseases, germs, viruses bacteria, etc. What is a Immune System? We are always surrounded by bacteria, microbes, viruses, toxins, fungus, pollution and parasites to enter into our body every second when we breathe in. They are very powerful that they can even dismantle our entire body. Look at a dead body - within a few weeks the entire body is decayed and destroyed. For anyone dealing with liver issues, Liv-a'Gain is one of the best tonics you can always turn to. When you use Liv a Gain? When suffering from gas, indigestion, belching (Khatti Dakkar), Fatigue and tiredness, Loss of Appetite, Sleep pattern disturbance and bloated stomach. Reduces gastric issue, enhances digestion and increases appetite, energy level is increased, sound sleep, reduction in distended tummy. Why Liv A Gain Liquid? Minerals are essential for proper growth & good health. The important minerals in Nutrilife are :- Calcium : Essential for proper development of bones and teeth. Iron : Essential for formation of haemoglobin in blood. Requirements of iron increase in excessive bleeding, pregnancy & lactation. Deficiency leads to anemia, Folic Acid : Essential for prevention of growth retardation, infertility, weakness and anemia Zinc : Essential for maintaining proper skin, hair, eye, sexual and growth functions. Proper nutrition leads to a healthier body and mind. Proper intake of food in right proportion provides the right kind of nutrition for health. ON & ON Nutrilife provides balanced Nutrition to the family. Take it daily with milk or warm water. Add sugar to taste. On & On NutriLife Can be added to Milkshakes, Juices, Soups, Flour etc for fortification. In the modern lifestyle, high pollution, poor diet, drug abuse, high stress level, poor eating habits, etc. deteriorate the quality of life. Food consumed does not have the required amount of essential vitamins and minerals, making it difficult to meet the daily requirements. Over a period this leads to deficiency disorders. About 50% of children in India suffer from nutritional deficiency. UN report confirms that 40% illness are a due to nutritional deficiency. Children in the age group of 10-19 years are suffering from nutritional deficiencies globally. 19% of adolescents accounting to 1,200 million suffer due to poor nutrition. This in turn hinders their growth and development. ON & ON is an easy way to add to a healthy lifestyle. ON & ON Nutrilife is a wonder food for adults. It contains Proteins, Carbohydrate, Dextrose, Vitamins, Fats, Minerals etc in right proportion to fulfill the nutritional requirement of body. It is a balanced nutrition for good health. ON & ON Nutrilife helps in meeting the daily requirement of nutrients. It helps in boosting immunity along with nourishing the body. It helps in compensating for the daily nutrition requirement. It may prevents vitamin and mineral disorders. The ingredients are Protein, Carbohydrates, Dextrose monohydrate, Skimmed Milk Powder, Vitamins, Fats, Minerals, Iron, Calcium & Zinc. ON & ON Nutrilife is enriched with proteins, carbohydrates, vitamins and skimmed milk powder. Every ingredient in this product contributes towards healthy life. Proteins : Building blocks of the cells of the body. It is made up of 20 amino acids. They are essential for the growth and repair of the body. Dextrose : Dextrose is D-glucose. It is required for energy production. Vitamins are necessary in very small amounts for normal growth, health and activities of our body. They catalyze biological processes occurring in the body. Vitamins though taken in micro quantities are of mega importance in life. The deficiency of vitamins causes many serious diseases. Elements Wellness Melt Fat granules is a novel blend of active herbs that are known to promote metabolism as well as thermogenic activity (to create necessary warmth to increase metabolism of lipids / fat, carbohydrates) at cellular level. The granules contain isphagula which is known to swell in the stomach giving a sense of fullness, thereby reducing tendency to over eat. Vrikshamla, Trikatu, Amalthas, Haritaki and Guggulu are known to promote metabolism of fat and carbohydrates. Synergistic presence of Tea catechins enhances this activity and published scientific studies have demonstrated catechins to promote fat metabolism( which is the reason for the product name). Regular consumption of Elements Wellness Melt Fat granules hence effectively supports weight management. For best results of weight management, complement consumption of this product with a healthy life style, supportive diet and adequate exercise . Novel combination of selected ayurvedic herbs at right levels and quality in a specially formulated as granules with Catechins, Vrikshamla, Guggulu, Haritaki and 7 potent herbs. The granules with its herbal and cardamom flavor helps you to avoid over eating, achieve better evacuation and promotes metabolism of fat and carbohydrates that are known to be causes of body weight. Contains processed isphagula husk powder potentiated with standardized tea catechins. Has added extracts of Vrikshamla, Guggulu, Haritaki, trikatu (Shunti+black pepper+long pepper), Amalthas, Methi powder and Vidanga powder. The granules taste is improved with sucralose and cardamom flavor. This novel combination is granulated and filled in to a sachet to provide free flowing granules of 14g per sachet. Drink 2 to 4 liters of water a day. Consume fruit juices adequately. Personal hygiene to be improved. As advised by healthcare professionals. Avoid sedentary life style, reduce or avoid alcohol intake, smoking and chewing of tobacco and lead a stress free life. Exercises that you are comfortable like jogging, walking, specific gym, yoga for at least 45minutes a day for 5 days a week is required. It is common that weight management seekers expect rapid reduction in body weight consistently. This is possible only when Melt Fat is taken along with diet and life style advice followed fully. Proportionate reduction in benefits will be seen if dietary and life style recommendations have low or poor compliance. Weight management seekers would get tremendous benefit if there is commitment in mind followed by Melt Fat intake + diet and life style management. The first signs of benefits are one or more of the following - feeling light, active, energetic feeling, better potty habits regularly, reduced bloating, and improved sleep. Consume a low calorie, low carbohydrate and low fat and fiber rich diet. Consuming millets, corns, oat and such other non- rice grains is recommended. Wheat can be taken. Supplement with plenty of fruit juices, vegetable salads, and protein rich diet. Consume milk and water adequately. Avoid too much of coffee, alcoholic drinks.